A bird's-eye view of NDCX-II. The injector is at top right, inside its grounded cage. Groups of induction cells alternate with diagnostic cells to form the accelerator. The end station is at lower left. A team of engineers and scientists just completed work on NDCX-II, a special-purpose particle accelerator designed to produce a high-quality, dense beam that can rapidly deliver a powerful punch to a solid target. 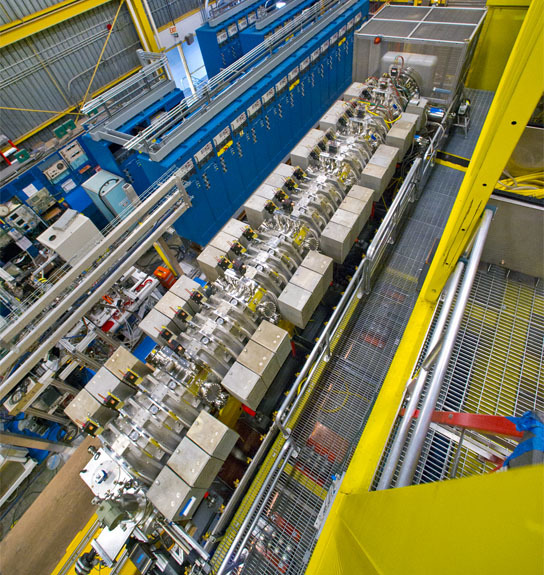 The just-completed NDCX-II, the second generation Neutralized Drift Compression Experiment at the U.S. Department of Energy’s Lawrence Berkeley National Laboratory (Berkeley Lab), is an unusual special-purpose particle accelerator built by DOE’s Heavy Ion Fusion Science Virtual National Laboratory (HIFS VNL), whose member institutions are Berkeley Lab, Lawrence Livermore National Laboratory, and the Princeton Plasma Physics Laboratory. NDCX-II is a compact machine designed to produce a high-quality, dense beam that can rapidly deliver a powerful punch to a solid target. 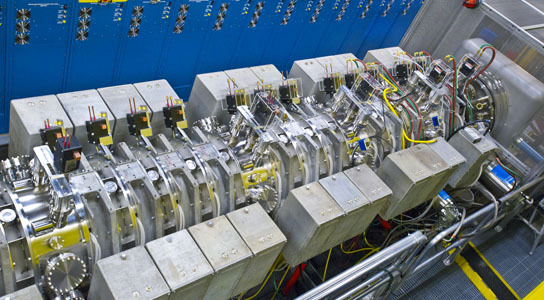 Research with NDCX-II will make advances in the acceleration, compression, and focusing of intense ion beams that can inform and guide the design of major components for heavy-ion fusion energy production. The beam quality of NDCX-II is monitored by measurements of the injected beam after transit through multiple cells. It has the potential to deliver enough power, quickly and evenly, to boost a thin-foil target into the regime of so-called “warm dense matter” before it expands and disintegrates. A close view of the upstream modules in the NDCX-II induction linac. Small coupling boxes at the top of the induction cells are for connecting power lines to the focusing solenoids, and large coupling boxes at the side will connect coaxial cables to carry the accelerating pulsed power, either from the pulse-forming network or the Blumleins. The eventual goal of heavy-ion fusion is to produce electrical power with particle accelerators through a process called inertial confinement fusion. Heavy-ion fusion is a particularly promising method of accessing this inherently clean and virtually limitless source of energy, fueled by naturally occurring hydrogen isotopes. There’s plenty of practical science to be done along the way to that goal, both in accelerator design and in the physics of the fusion-fuel targets. The poorly understood realm of warm dense matter is of special interest – called warm because its temperature is measured in thousands of degrees Kelvin instead of the millions of degrees typical of nuclear fusion. Denser than a plasma – a hot gas of electrons and atomic nuclei – but not quite solid, warm dense matter exists in the cores of giant planets and as a way-station on the road to fusion. The rapid heating required to create warm dense matter – and eventually achieve the fusion of a solid-fuel target – requires a very short, very high-current pulse accelerated to the right energy. The insert at bottom shows the computer simulation of the ion beam exiting the accelerator section and entering the neutralized drift compression section, where neutralization allows the tail of the pulse to catch up with the head and compress to a length of a mere nanosecond, a billionth of a second. Above is an artist's conception of the nanosecond pulse entering the foil. NDCX‑II is an induction accelerator that can handle compact pulses of some 200 billion positively charged lithium ions, shaping each pulse as it is accelerated, and making sure that almost all the ions are delivered to the target within a nanosecond, a mere billionth of a second. But when they start from the injector, the ions are spread out in a 500-nanosecond pulse whose tail is moving slightly faster than its head. During initial acceleration, the overall pulse length shortens to less than 70 nanoseconds. After further acceleration, the pulse enters a drift tube filled with plasma, which neutralizes the mutually repulsive charge of the positive ions and allows the pulse to compress, as its faster-moving tail closes the final distance to the head while focusing on the target. This process of neutralized drift compression gives the machine its name. Lawrence Livermore National Laboratory provided the accelerating cells, which were previously used for its Advanced Test Accelerator. They were then modified and rebuilt for NDCX-II at Berkeley Lab. 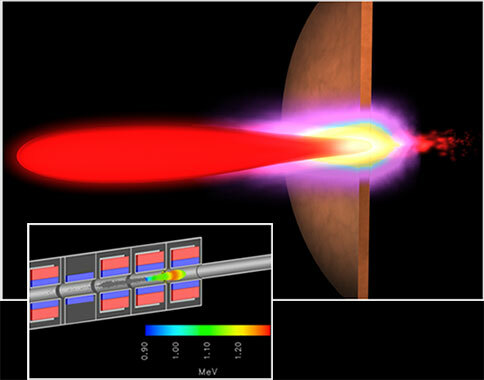 Berkeley Lab also fabricated new diagnostic “intercells” to monitor beam quality in the accelerator. The accelerator is readily reconfigurable by rearranging the cells. The first several induction cells are powered by long-pulse voltage generators, but when the pulses become short enough, the accelerating power is supplied by 250,000-volt, pulsed-power sources called Blumleins, also supplied by Livermore. The drift chamber that finally compresses and focuses the beam is equipped with a plasma source provided by the Princeton Plasma Physics Laboratory. NDCX-II’s robust design and ultimate machine performance were established through simulations at the National Energy Research Scientific Computing Center (NERSC) using the Warp-3D ion-beam optics code developed by David Grote of Livermore and Berkeley Lab’s AFRD, in collaboration with Alex Friedman of Livermore and AFRD, Jean-Luc Vay of AFRD, and others. Grote and Vay used up to 6,000 processors and over a million hours of machine time on NERSC’s Franklin and Hopper supercomputers and other NERSC platforms. The study begins with thin foil targets, not giant planets, and key aspects of heavy-ion fusion-target physics can be addressed with NDCX-II. Warm dense matter is new territory for understanding a variety of astrophysical phenomena, an important research field in itself. Much closer to home is the preparation for a new generation of power plants on Earth, mimicking the engines of the stars. Work on NDCX-II was supported by the DOE Office of Science. Be the first to comment on "NDCX-II, A Special-Purpose Particle Accelerator"